What a delightful day! It actually began last night when I babysat my granddaughter (continuing into this morning). You know, babysit is not exactly what I do. In fact, it’s closer to “hanging out with Elle.” I am her playmate. “GRAMMA!” she squeals, calling me to play when I leave the room or attempt to do anything that is not directly related to the game of the moment. Of course, I don’t mind at all. When she snuggles up next to me on the couch, there is nothing better. Elle and me TOGETHER! After hanging out with Elle, I went to the park to take some pictures. Within a few minutes, I happened upon this man and asked if I could take his picture. He gruffly answered that he was doing yoga so I started to move on after sneaking this first shot. Then I decided that annoying him might just be worth it, especially if my annoyance came with a little cash. 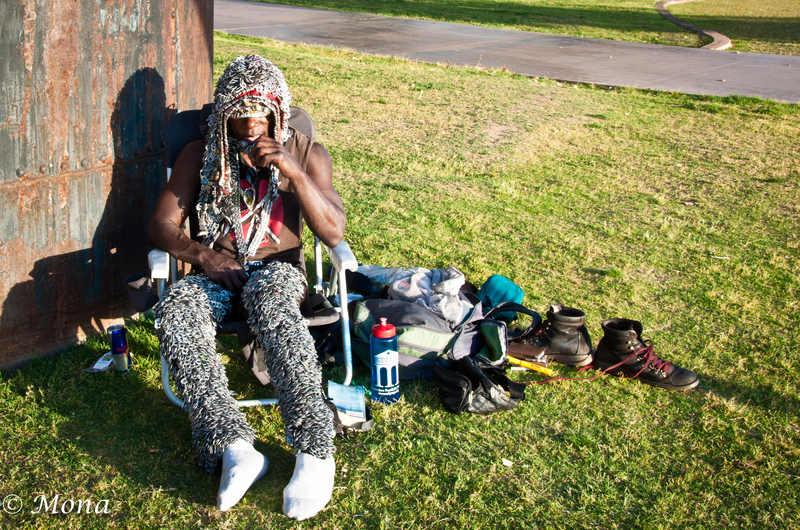 I think he told me he’s “Lizard Man.” Look closely at his costume made of pull tabs (and more). I asked if he made it himself and he proudly answered that yes he did. He also informed me that if I really wanted to take some pictures of him I could do so at the Starbuck’s on Mill Avenue every afternoon. When I asked again if I could take his picture, he insisted that anyone who takes his picture must be in it also. I wondered if his young female companion might just walk off with my Nikon, but I thought I could possibly chase her down. (As you can see, I didn’t need to.) He also insisted that I give the peace sign. I was only too happy to oblige. 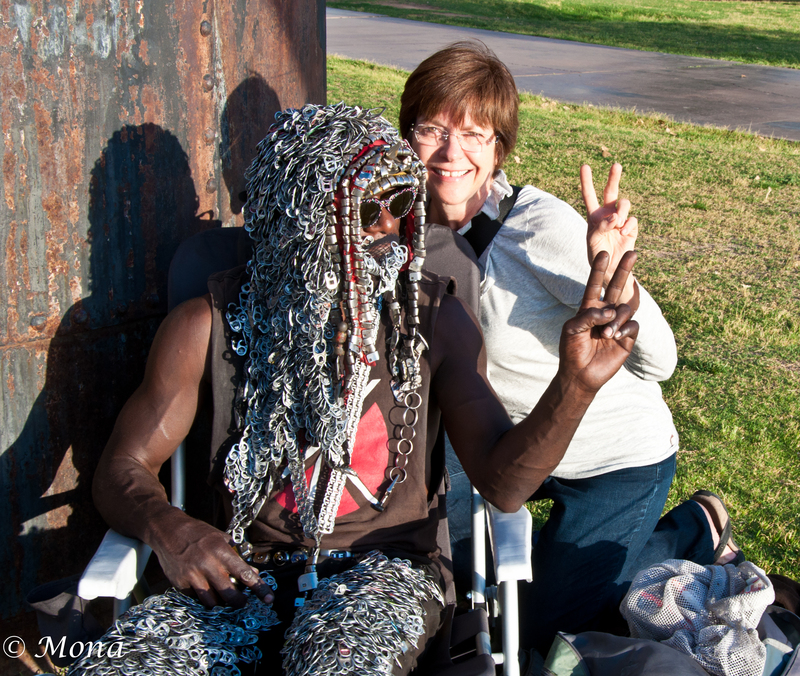 So, in a way, I took a picture TOGETHER with Lizard Man in the park today. After I gave him a few dollars he thanked me and then reminded me that he needed to finish his yoga, soaking up the sun like a lizard. After my moments TOGETHER with The LIZARD MAN, I captured the fragile bougainvillea blossom (that blooms on the nastiest thorniest branches ever). All TOGETHER … a very fine day. Wow, what a great day of togetherness you had. 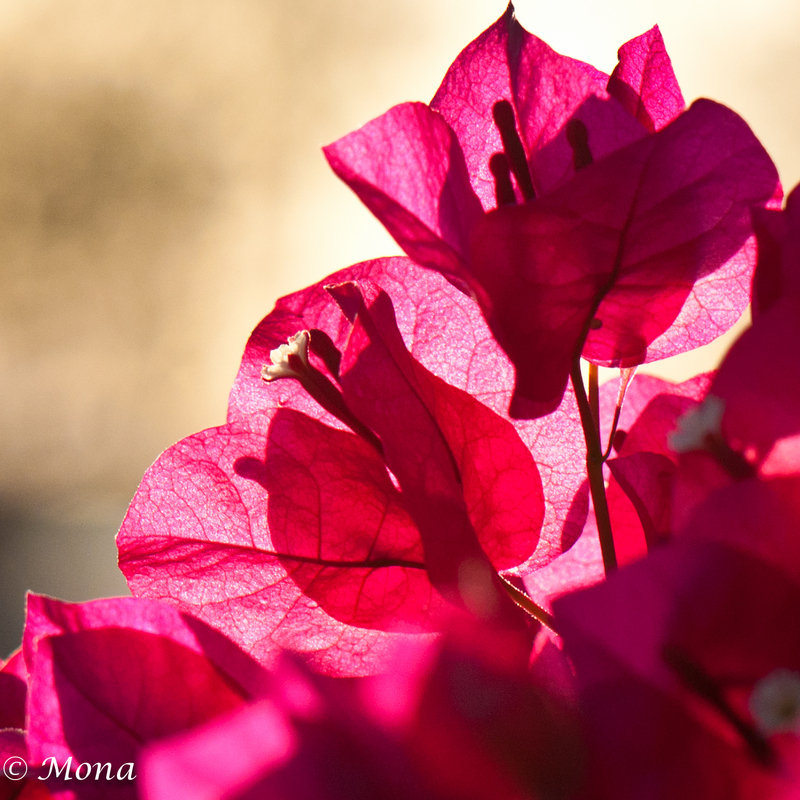 I also love the transparency of the bougainvillea petals (leaves?). It reminds me of Queensland, where I come from. A hot place. Fantastic post, Mona. I admire your tenacity in getting people to agree to be photographed. He makes such a great subject. Wow! I would have loved to photograph Lizard Man. What an unusual man. I wonder what is the meaning of the tabs, if any, on his head and legs. Great shot. That tab headpiece could be in a museum. Cool picture of togetherness. I like to engage in conversation and get permission, too. Somehow it feels awkward to “take” a photo and that is why I am not a good street photographer. This is just wonderful. All your together photos are awesome!